Encourage eye tracking and sound perception skills with the Wild Forever Musical Mobile by Trend Lab. 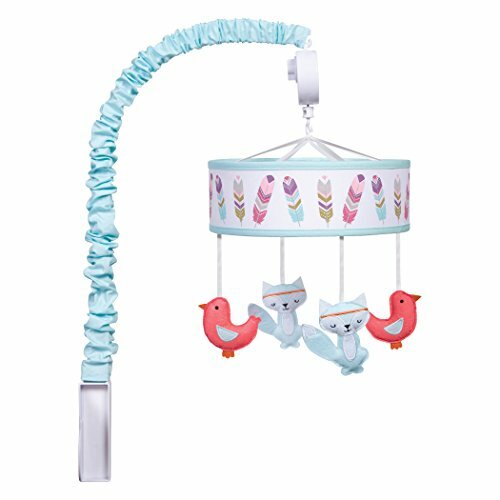 Wide banded mobile ring features a silver, pink, coral, teal, green and purple feather print on a white background with teal trim. Slide cover is coordinating teal. Two adorable teal felt stuffed fox and two coral felt stuffed birds are suspended from decorative white ribbon and slowly rotate to Brahms' Lullaby. Mobile easily attaches to most cribs. Mobile measures approximately 24 in tall by 20 in wide. This mobile coordinates with the Wild Forever collection by Trend Lab.